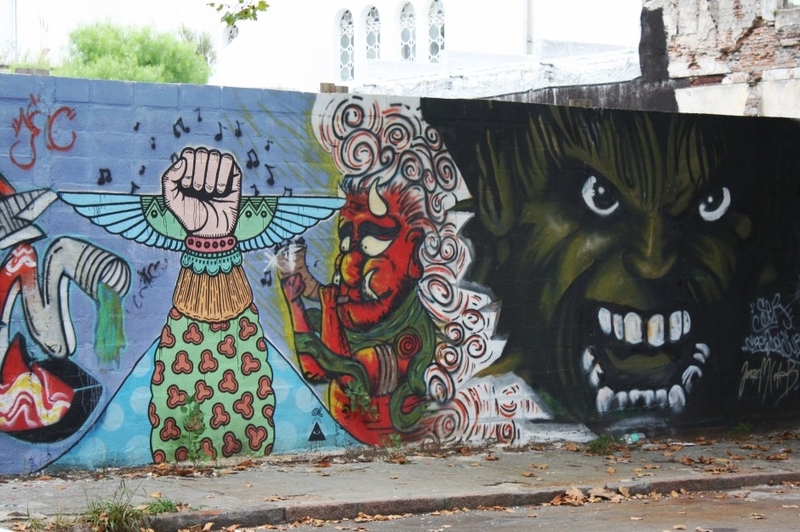 Montevideo’s aerosol dialogue spans the spectrum from murals to activist scrawlings to stencils to masturbatory tags. The selection below reflects what I feel best captures the artistic liveliness of the streets. 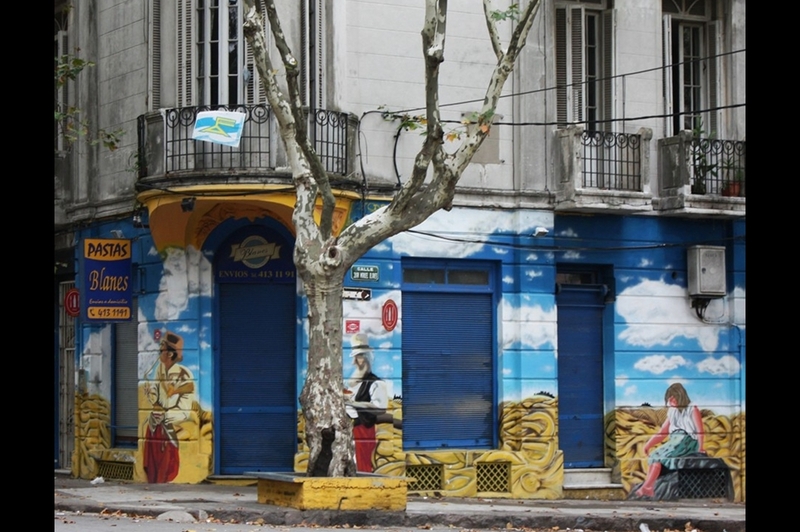 A current of social electricity courses through the streets of Montevideo, Uruguay. It runs through the plazas bustling with friends sharing mate tea gourds; it marches along with groups of candombe drummers on their weekly routes. 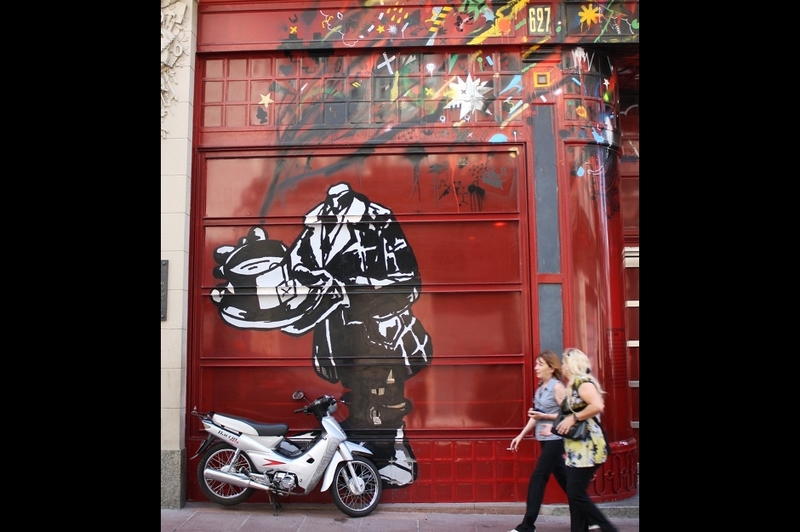 The city’s murals and street art capture and relay the energy of the streets with a visual layer of dialogue. I found it difficult to credit all the artists, as many pieces are unsigned—suggesting, I think, an emphasis of the artistic message. Headless and towering over vehicles and humans alike in Ciudad Vieja. 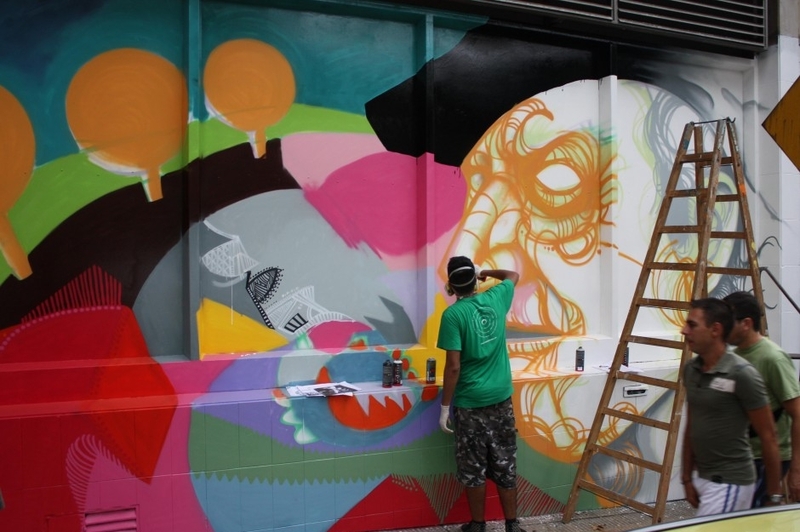 Artist Oz Montania paints a mural celebrating the art of Manuel Espinola Gomez on the facade of the foundation named after said deceased Uruguayan artist. Montania, a Paraguayan, was in Montevideo to teach a graffiti workshop. A kitchen that makes handmade ravioli and gnocchi has a mural wrapping its windows and doors in the Parque Rodo neighborhood. 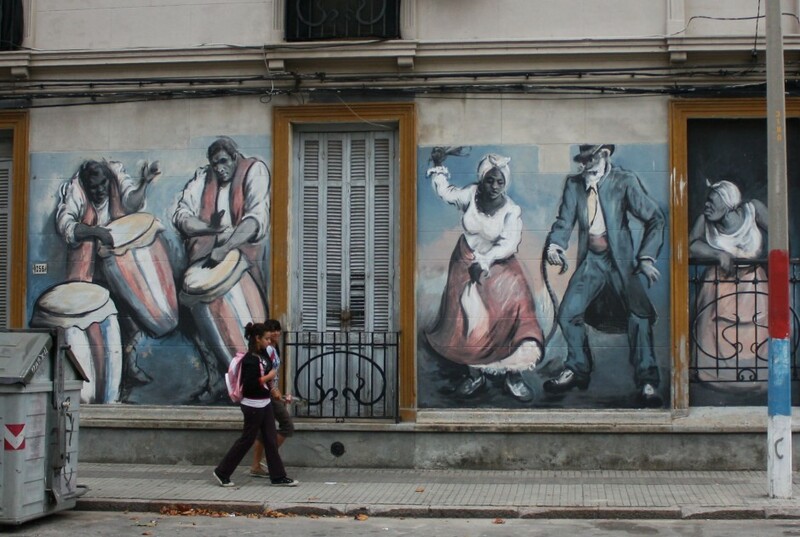 Music meets visual art in a mural, painted by Alvaro Neco Bordagorri, reflecting on the city's tradition of candombe drumming in the streets. In the background, a skeleton of a derelict oil silo keeps watch. I noticed the respect the artists had for the others in this collage in the Palermo neighborhood. Each artist worked within the context of the others' work to insure that no piece was painted over. Few taggers have chosen to hit the wall. 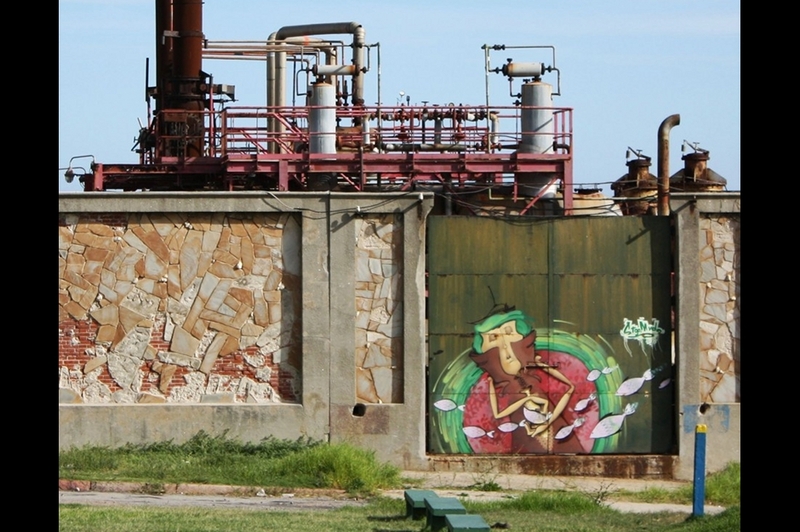 A piece by Stop Mudo decorates a rusty industrial site on the waterfront. 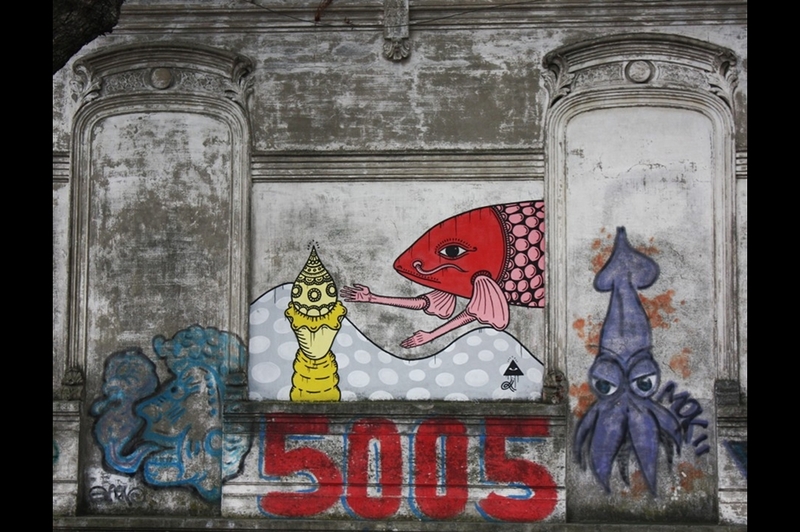 Several different artists worked within the historical details of this wall in Palermo, Montevideo. 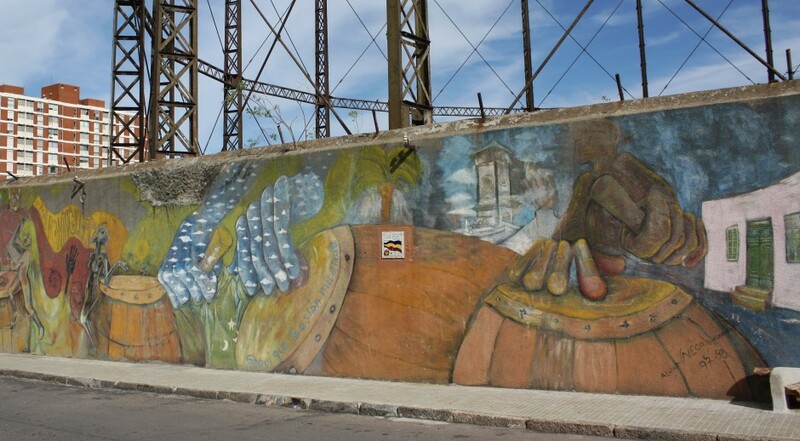 Courtesy of the Dr. Pedro Figari School of Art and Artisans, a mural celebrating the Afro-Uruguayan origins of Candombe drumming and dancing appears in Palermo, one of the neighborhoods most frequented by marching street drummers. At another piece near the derelict oil silo, taggers have avoided painting over the details of this piece. 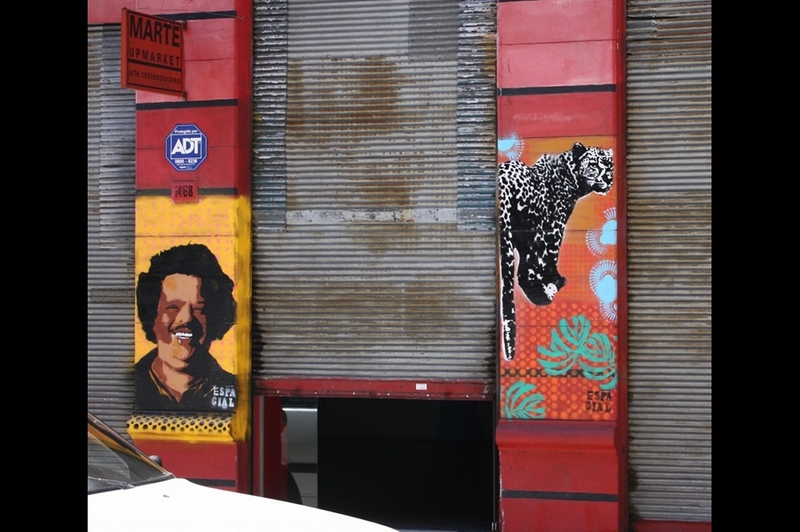 A double dose of Espacial, whose stencil work can be found scattered around the Ciudad Vieja neighborhood. 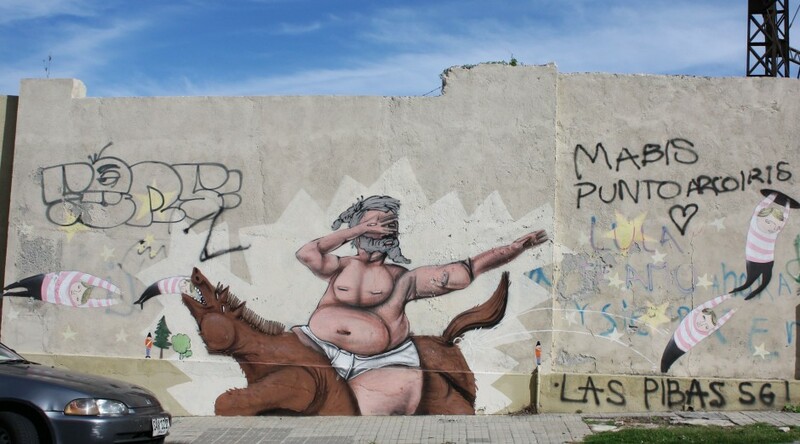 These two appear on the outside of a modern art gallery, blurring the line between what we are supposed to view as graffiti and traditional art. Pocitos, one of the more upscale neighborhoods, is not immune to stenciling. 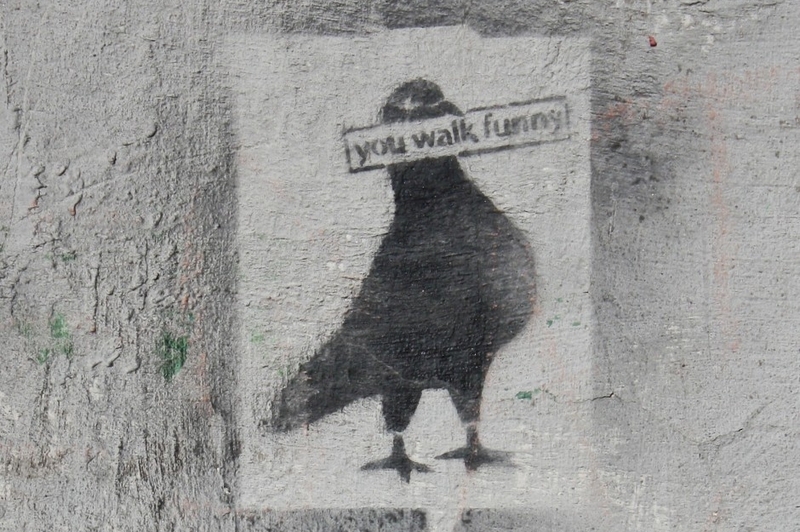 The use of English as a captioning language of stencils is a common practice in the area. 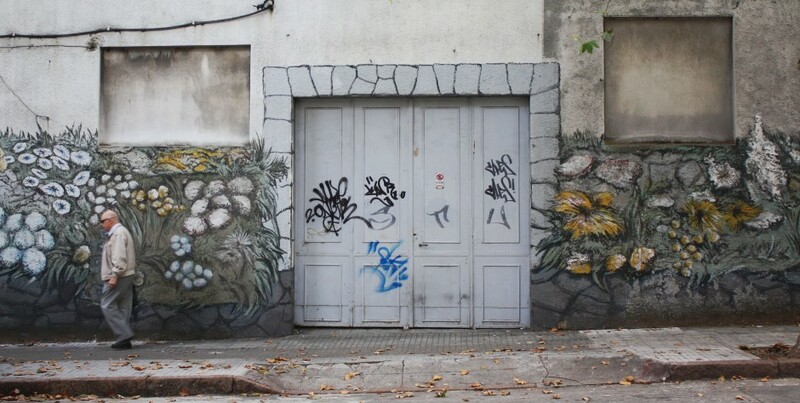 A little trompe l'oeil foliage helps give color to concrete in Barrio Sur. 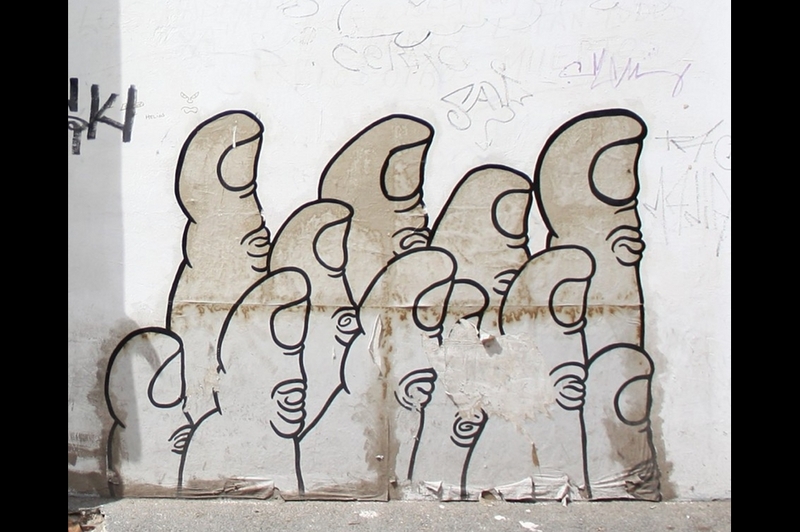 Eleven thumbs have been pasted to a wall outside a cafe in Ciudad Vieja. The Groupie stencil appears throughout several different neighborhoods. 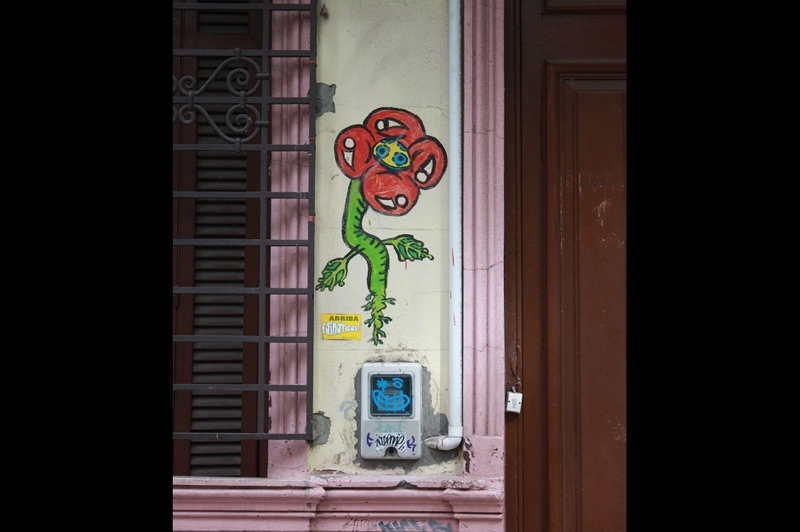 A mildly anthropomorphic flower on a thin slice of flat real estate on a crumbling, century-old facade in Barrio Sur.